Chronic kidney disease patients, especially those in the stages of kidney failure, have to be careful with their diets. There are restrictions that need to be followed for your comfort and overall health. This is because your kidneys are unable to process and filter out certain vitamins, minerals, and waste, nor can they carry out the many functions they are responsible for in the body. So are you looking to find out what iron rich foods that you can eat with chronic kidney disease. Unfortunately, these restrictions can often cause deficiencies. One main example is that protein rich foods are often on the restricted list because the extra proteins cannot be flushed from the body, which can lead to a buildup of protein waste. In some cases, protein rich foods are on the restricted list because of this reason. For others, such as people on dialysis, those protein rich foods are actually recommended, because hemodialysis often depletes the body of so much. Issues with protein also lead to issues with iron deficiencies. Most protein rich foods are also great sources of iron, which is a very important mineral to many bodily functions. Iron helps the body make red blood cells, which carry oxygen throughout the body. An iron deficiency, known as anemia, can lead to feeling faint or weak, fatigue, headaches, and shortness of breath. Chicken— Lean cuts of boneless, skinless chicken breasts are a delicious, high protein, high iron healthy meal entrée. Simply place in a pan, cover with foil and bake for 30 to 45 minutes on 350 degrees until cooked through. Tofu— Tofu is a versatile soy product that can be used in many dishes as an entree or meat replacement. Contrary to popular believe adding some non GMO soy to your diet is good for you. To prepare, always press the water out first so it’s not soggy. Soy takes on the flavors of the spices and sauces you use and can be a very versatile addition to your diet. Pork Chops— Another lean white meat, pork chops are easy to cook in a variety of ways and are high in protein and iron. Broiling, braising, and grilling are healthy ways to prepare. You can roast a lean pork loin in advance and use cold slices to add to a salad. Some Burgers— Not all burgers are created the same. Look for these specific types of burgers to fulfill your protein and iron needs while still being kidney friendly: turkey burgers, veggie burgers, and lean 100 percent beef burgers. Dried Apricots— Dried apricots are a delicious and easy snack for any time of the day, and are high in iron. Make sure that anytime you choose dried fruits that you are avoiding added sugars, oils or nitrates. Iron rich foods that are safe for kidney failure patients can be found just about anywhere, you just have to know what dangers to avoid and how to properly prepare. Keep your eye out for these foods and increase your protein and iron intake, while enjoying delicious foods on your kidney safe diet. 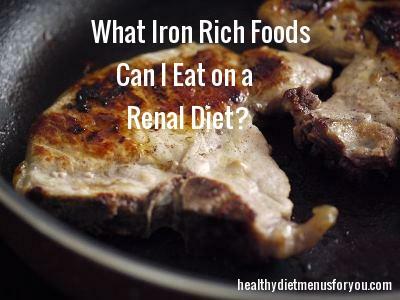 Want to know more about iron rich foods that you can eat with chronic kidney disease? Visit my sister site for more information on Kidney Failure.